A 1980s New York Performing Arts School is the set for Woodham Youth Theatre’s production, to take place next week. A 50-strong cast are ready put on their legwarmers, sweatbands and dancing shoes for the knock-out show of ‘Fame’, which includes songs such as Dancing on the Sidewalk, There She Goes and Hard Work. The energetic cast have been rehearsing since September and the aspirations of the characters in the show are reflected in the real lives of the Newton Aycliffe students who are in the production. "I Joined Woodham Youth Theatre because it has given me confidence for acting and has meant I’ve made loads of new friends. 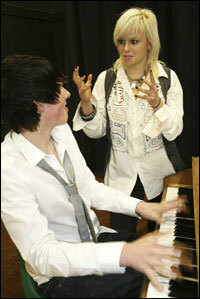 It has influenced me to study Drama, Music and Media at college and maybe go to auditions once I leave school. Woodham Youth Theatre has given me a new interest in this area which I probably wouldn’t have had otherwise." Elle Ainslie (year 11) who plays Lambchops says "Woodham Youth Theatre has changed who I am. Thanks to the cast and directors I now have the confidence to do things I would never have dreamed of 4 years ago. The buzz I get from being on stage is a feeling I’ll never be able to forget!" Miss L. Tindall – director/choreographer hopes that everyone endeavours to see this show. "There is some bright, young talent on the stage and this performance is their dream come true." The production of ‘Fame’ is being performed at Woodham Community Technology College on 4, 5, 6 March at 7pm.